Dr. Bill Israel, author of book: A Nation Seized: How Karl Rove and political right stole reality, beginning with the news. Karl Rove funnelled multi-millions of dollars from wealthy, anonymous donors to tip the American elections of 2014, just as he dominated elections in 2000, 2002, 2004, and 2010. A Nation Seized maps how Rove wins, by quoting unpublished lectures Rove gave at the University of Texas at Austin, where he taught "Politics and the Press" with the author. 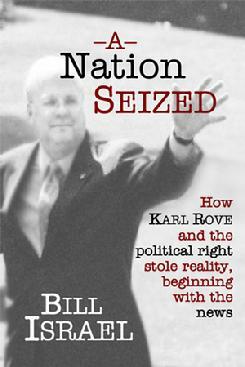 The book, for the first time, presents the Karl Rove playbook, in Rove’s own words. For 2014, Rove’s strategy appeared to be even more potent. It combined with decades-long organizing by the American political Right, for which Rove was both a central coordinator and a leading beneficiary. The organizing began in the 1930s, then burst in the ‘70s-‘90s to produce hundreds of conservative institutions and media and thousands of political operatives, like Rove. Together, they not only brought Congress to a near-standstill; they seized the U.S. Supreme Court, the House of Representatives, and most state and local governments. They also appeared to reverse what and how Americans think. A Nation Seized documents how these developments distort American news and politics. It shows why immigration and debt limit debate came to impasse, while conservatives sought to cut taxes for the rich, defund public education, and cut medical care for the poor, the infirm, and the elderly. The book demonstrates how the Right stopped journalism, and why Barack Obama faces overwhelming odds in the remainder of his presidency. A Nation Seized charts how Rove and the Right have transformed America's politics and journalism, and why they may dominate for the next generation.